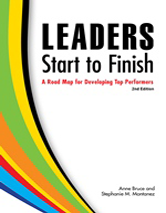 Leaders Start to Finish offers detailed, specific insight and instructions on how to develop highly effective leadership training programs that will produce engaged and authentic leaders in your organization. What Sets Authentic Leaders Apart From the Rest? Is Your Organization Lacking in Humanity? Is Your Organization Lacking in Civility? What Is a Human-Oriented Leader? What Is the Purpose of Having an Employee Development Plan? The Strategic Approach—What Do We Need to Be Doing to Survive and Thrive?…. The Tactical Approach—How Will Our Organization Get There and How? What Does Leading Human Capital Have to Do With Culture? Chapter 11: Leading in a Virtual World—Leaders Will Require "Telepresence"
Is Your Organization Ready to Become the Primary Educator of Its Workforce? What Are Purpose and Passion? Fear Motivation: Miss One Piece and You're Fired!